Just a reminder that all of my recipes are always 100% vegan, just in case I scared you a little with that picture. 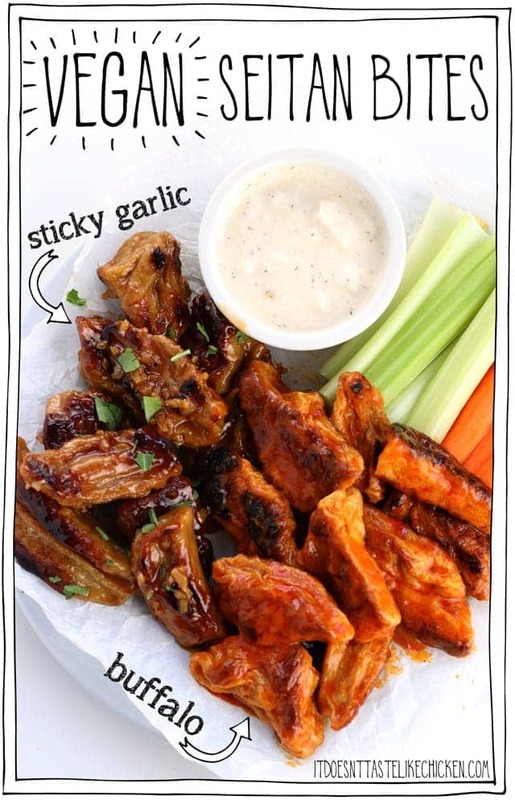 Because hot dang those vegan seitan bites are looking a whole lot like chicken wings. 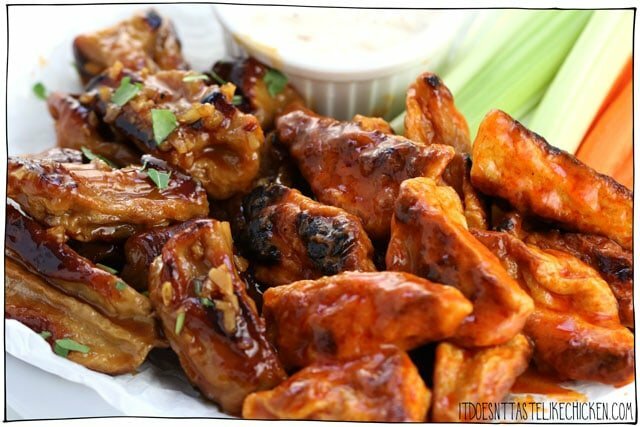 Fear not, no chickens were harmed in the making of these vegan chicken wings. 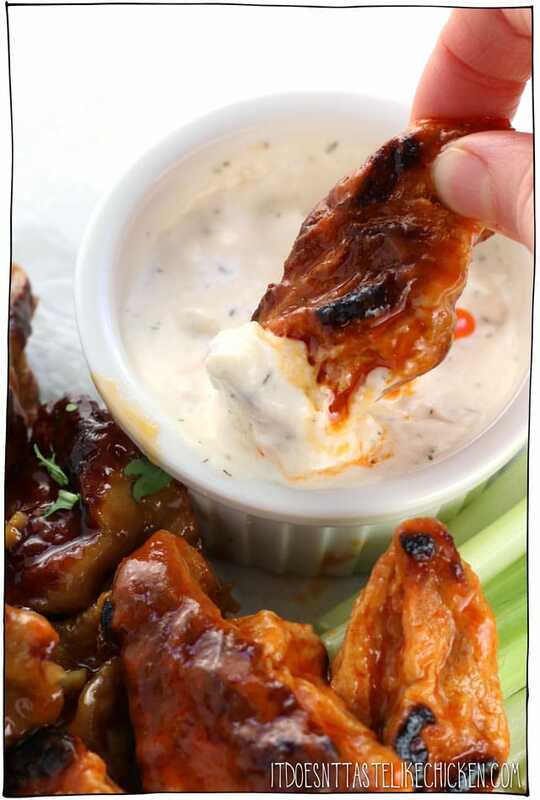 But they sure are sauce drippingly, sticky finger, scrumptious nibbles with vegan blue cheese dip for dunking those seitan bites in. Ooooh yeah, this is some quality bar food right here. Coming at you in two flavours: sticky garlic, and buffalo (or you could do all one flavour if you prefer). These vegan seitan bites make a mighty fine feast for Superbowl Sunday, game night, pub night, or just about any night you want to dive into some classic party food deliciousness. The seitan bites can be made ahead of time, and so can the sauces. When you are ready to feast you can just fry up the seitan bites and toss in the premade sauces. Or they actually reheat very well too! Meaning you could even make the seitan bites fully prepared with sauces and all, then just reheat, covered in a pot along with the sauce, over medium-low heat. How easy is that!? To make Vegan Seitan Bites: start by making the recipe for Vegan Seitan Tenders. Instead of forming the seitan into oval shapes, use scissors to cut the dough into small wing sized pieces (they will almost double in size, so keep them on the smaller size). One batch of seitan tenders should make about 25 to 30 wing sized pieces. Spread the pieces out on a well-greased steamer basket. Use spray oil to generously coat the seitan bites to stop them from sticking to each other as you layer them. Steam at a simmer for 25 minutes. The seitan bites will merge together into one lump, but don’t worry, let the seitan cool and shrink up a bit. Once cool you will be able to pull apart the seitan bites from each other. If any stick, simply use a knife or scissors to cut pieces. *Alternatively, if you have already prepared Vegan Seitan Tenders, you can use a knife or scissors to chop the tenders into wing sized pieces. 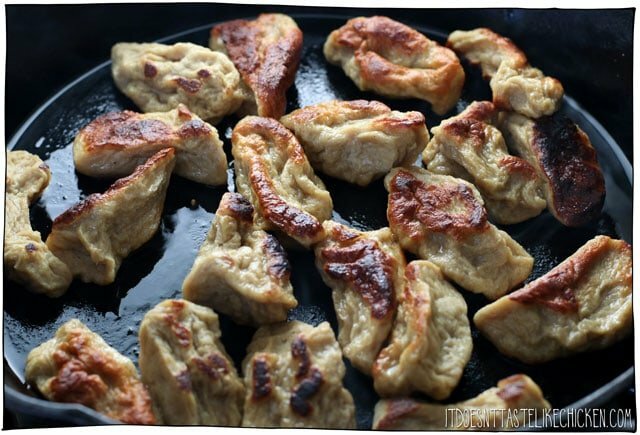 To fry the vegan seitan bites, heat two tablespoons of light oil in a large skillet or frying pan over medium-high heat. When hot, add the bites and fry a couple minutes per side, turning as needed until they are golden brown all over. You may need to do this in batches depending on the size of your pan, adding more oil if needed. To make the sticky garlic sauce, in a small pot, whisk together the garlic, syrup of choice, apple cider vinegar, soy sauce, and corn starch while everything is still cold. Turn on the heat to medium, and cook for about 5 minutes, being careful not to burn, whisking often until the sauce thickens a bit. Toss half of the fried seitan bites in the sticky garlic sauce. To make the buffalo sauce, whisk together the hot sauce with the melted vegan butter. Toss the remaining half of the seitan bites in the buffalo sauce. 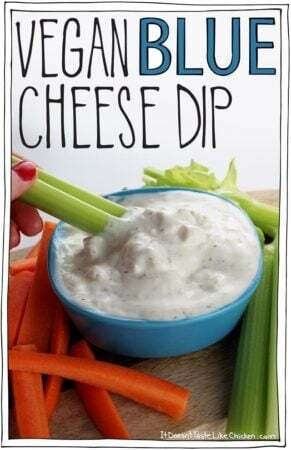 Serve hot with celery and carrots sticks, my vegan blue cheese dip, and a lot of napkins! This classic bar food served with vegan blue cheese dip and all! Make ahead recipe. 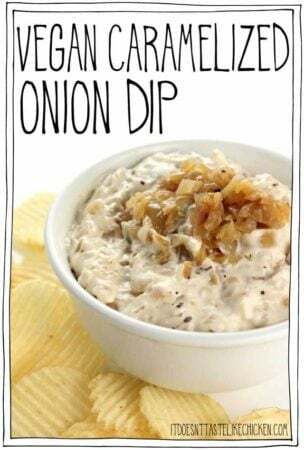 Perfect for Superbowl Sunday, game night, or a party appetizer. 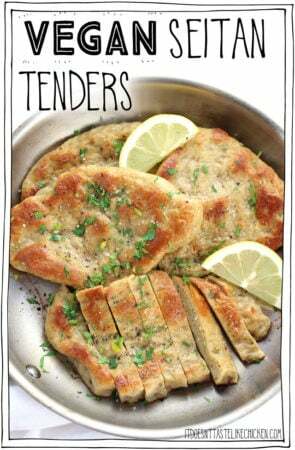 Make the recipe for Vegan Seitan Tenders. 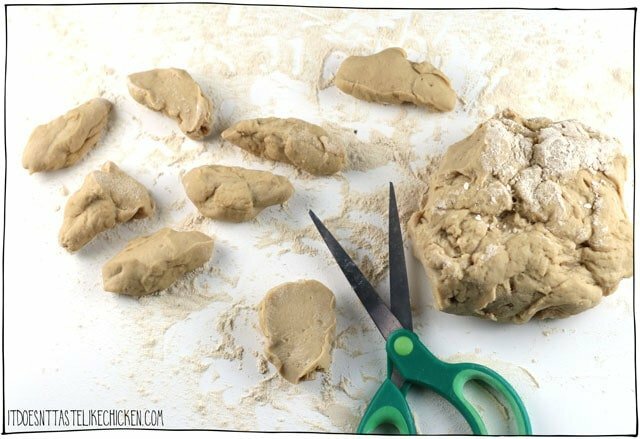 Instead of forming the seitan into oval shapes, use scissors to cut the dough into small wing sized pieces (they will almost double in size, so keep them on the smaller size). One batch of seitan tenders should make about 25 to 30 wing sized pieces. Let cool, covered in the fridge for a minimum of 30 minutes or up to 3 – 4 days before frying. Make the sticky garlic sauce: in a small pot, whisk together the garlic, syrup of choice, apple cider vinegar, soy sauce, and corn starch while everything is still cold. Turn on the heat to medium, and cook for about 5 minutes, being careful not to burn, whisking often until the sauce thickens a bit. Toss half of the fried seitan bites in the sticky garlic sauce. Make the buffalo sauce: whisk together the hot sauce with the melted vegan butter. 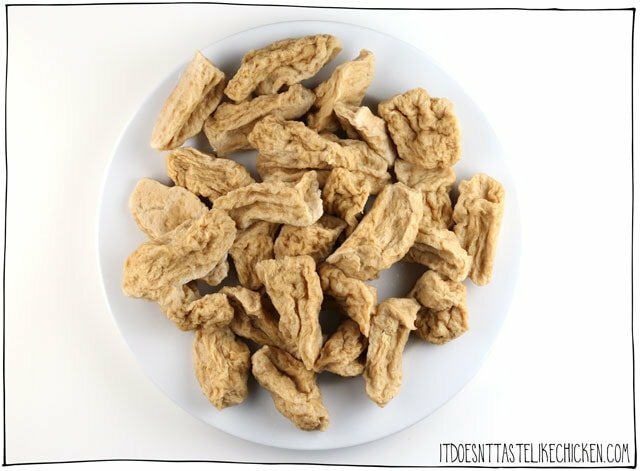 Fry the vegan seitan bites: heat two tablespoons of light oil in a large skillet or frying pan over medium-high heat. When hot, add the bites and fry a couple minutes per side, turning as needed until they are golden brown all over. You may need to do this in batches depending on the size of your pan, adding more oil if needed. Toss half of the fried seitan bites in the sticky garlic sauce, and the remaining half in the buffalo sauce. Serve hot with vegan blue cheese dip, celery and carrot sticks. 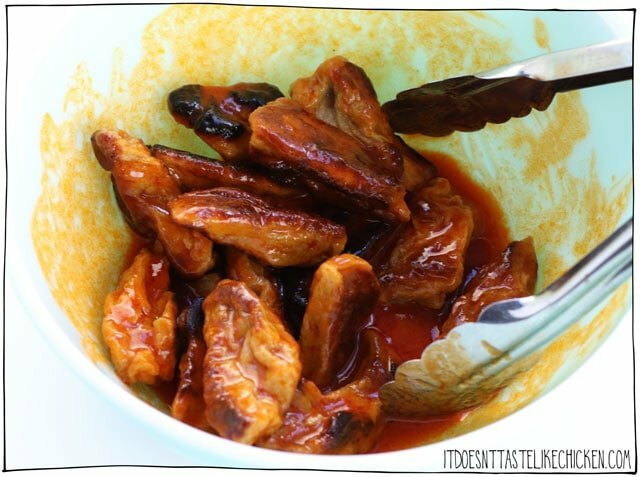 *If you would prefer your seitan bites to be all one flavour, make a double batch of the sauce of your choice, and skip the other sauce recipe. Toss all of the seitan bites in your double batch of sauce. Oh MY GOD!!!! These are the best, most delicious things I had so far!!! I am in love!! And the creamy mushroom coconut pizza!!! Sam, you are amazing!! Thank you! ❤️ your Seitan Steak recipe btw! I was so excited to make the Honey Garlic Seitan bites but I am not so excited with the result. In processor, it never balled up and I was afraid of over processing so I finished by hand. The bites came out very hard and chewy. Cannot cut with a knife but I can chew, a lot of chewing required and they are digesting like litttle rocks. Very disappointed. What did I do wrong? Love the sauce though. Hi Donna, sorry to hear the recipe didn’t work for you. It’s very difficult to know what went wrong without being in the kitchen with you. It sounds like a measurement might have been off somewhere. The dough should be very soft and sticky. It doesn’t require any kneading, kneading it will make it tough, and it should puff up to double the size when steaming at a simmer to make it tender. Did all of those steps happen? I usually measure carefully. The only reason I felt I had to knead was that it did not turn into a ball in processor. and I did not want to over-process. I’ve made your Seitan Steak recipe several times and always comes out perfect and delish. So I kneaded by hand just a bit to form into a ball. It was somewhat sticky but did not get to twice size in steaming. I was surprised when I lifted lid. What I did notice was that the ingredients did not seem to blend well in processor. It had a grainy texture, if that helps. I am still so disappointed as I really like the sound of this recipe. Would love to figure out what I did wrong. I definitely sounds like something when wrong, the dough isn’t grainy at all and it should blend easily in the food processor and be very very sticky. Sorry it didn’t turn out for you. I am going to try it again. I must have done something wrong as everyone else had success. It looks to good not to try. Hi Donna – using a different method might make a difference! I don’t have a food processor, so I make the seitan tender dough in my blender. I combine all the ingredients except the VWG and blend until smooth. Then I pour the mixture into a bowl and add the VWG. Trying it this way might help you eliminate the graininess you’re having trouble with. Hope you can make it work, it’s a great recipe! The “honey” garlic sauce is indeed incredible! 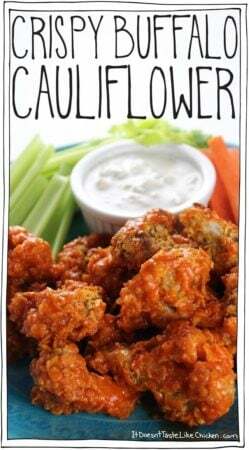 Re-post from the “tenders” page: I’m so pleased with how easy this recipe is! I made one batch and split it into half no-chicken breasts (3), and half into bites/wings (17) with a honey “sticky garlic sauce” (using Bumble vegan honey). BUT I have a few things I would change next time. 1) Next time I will double the water (to 1/4 cup). When I followed the directions, the dough didn’t really form a ball, just a bunch of crumbly bits, because it was too dry, so I had to knead it to get it into one body. I think this over-kneaded my batch of wings and made it super chewy, like hard-to-eat-and-tear-a-bite-off-chewy. I haven’t tried the tenders yet, but I imagine they’ll be the same, however, easier to eat cut up into bite sized pieces.. 2) Due to the issue above, I would also make this recipe with weighted measurements when they are provided to make sure I’m getting the correct wet/dry balance. I can’t wait to make this again! I’m used to making seitan with mashed beans, and the tofu sub is amazing for the texture and moisture. Thanks IDTLC! Your recipes have literally been saving my vegan days!! I recent became vegan at Thanksgiving (here in the states) – and haven’t looked back since. These are so delish!! Not sure yet about the mushy inside texture, BUT enjoying them regardless! So happy you are loving them, Kate! They shouldn’t be mushy inside, it’s difficult to say but it sounds like they might have not been cooked long enough. Hopefully you get a better texture next time! Will definitely try again! The first time I tried your Seitan steak, it was a disaster, i tried to put too much in my food processor, (someone who doesn’t know how to cook for just one LOL). I can’t wait to nail Seitan recipes! 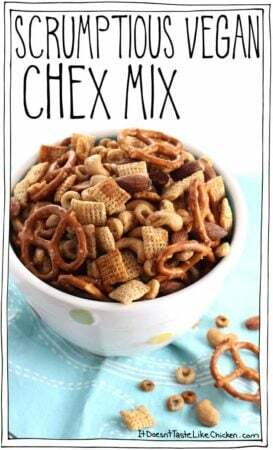 I made these for dinner tonight as i didn’t want to use an untried recipe for appetizer night (aka the super bowl). Delicious. Absolutely delicious. The sticky garlic sauce was amazing, the buffalo sauce was exactly as I expected, and the blue cheese dip was very tasty. Definite do over! These are amazing! I ended up making a few substitutions in the seitan and the sauce because it was too cold to go to the store, but they still turned out great. I can’t wait to follow the recipe more closely, and I’m looking forward to making them for one of my vegan friends. Sam, your sticky garlic sauce is the star of the show here. As vegetarians, I think we’re always hunting for interesting sauces, right? (For me, tofu, seitan, etc do not have a ton of flavor, and they mostly soak up the flavors of what is surrounding them.) So, a really good sauce is like gold. I just *loved* this sauce. Super-easy, and really really tasty. I’ve already started experimenting…adding a bit of sriracha sauce to give a bit of heat; adding pepper flakes to give a different kind of heat; browning the garlic first for an extra level of flavor; trying honey, agave, etc in place of syrup. You have sort of created a monster. There are now 7 Tupperware containers in my fridge, and I and my girlfriend have enough versions of garlicy seitan to feed a small [vegetarian!!!] army. And I haven’t even started experimenting with the buffalo sauce! Thanks again. Looking forward to your next bit of brilliance with your next recipe posting..
With regards the above comments; I had to use butter beans in mine as the supermarket had run out of soft / silken tofu when I went to the shops….I guessed at an approximation of similar consistency and supposed butter beans would be as close as I could get! 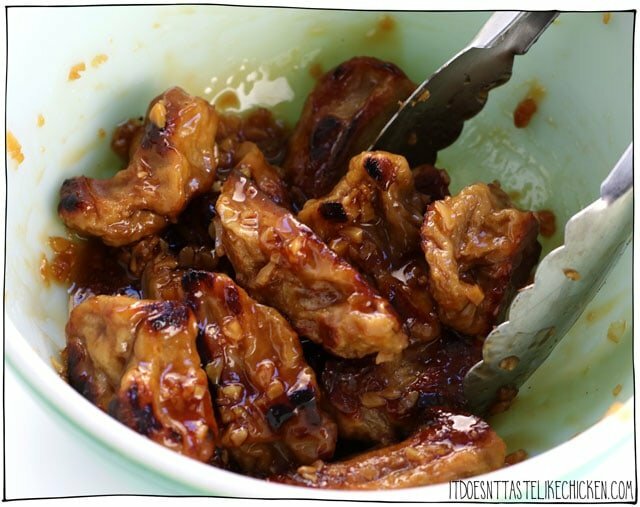 They were delicious – I actually have yet to make it with the tofu!!! My husband is a very fussy vegetarian….tofu in anything means he’ll turn his nose up at it before trying (bad experience with it thirty years ago? ); in this instance I was able to categorically “not lie” and he thought they were superb – a serious compliment from a man who believes that food is just there for sustenance and doesn’t care what it tastes like (unless it’s tofu….or aubergine…..or courgette…..like I said, very fussy!). Thank you very much for the recipe, and sorry for tweaking, but I am very grateful for the easiest seitan recipe I have found so far! I had been putting it off until this point! Hi Lea. As this recipes clearly shows, there is zero tofu used. So, no problem with this recipe accommodating your dietary restrictions. 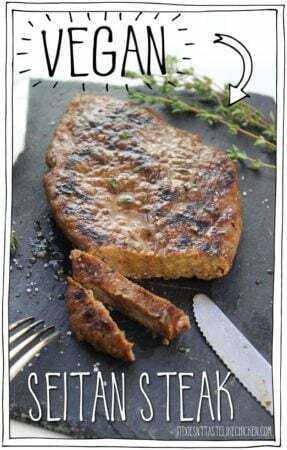 To make seitan, you need (depending on the recipe) either flour or vital wheat gluten…so this would not work for people with a sensitivity to wheat products. Fortunately, you are not in that group! Hope you enjoy this recipe. oops. My bad, Lea. My own recipe for seitan does not use tofu, so I assumed that Sam’s did not either. 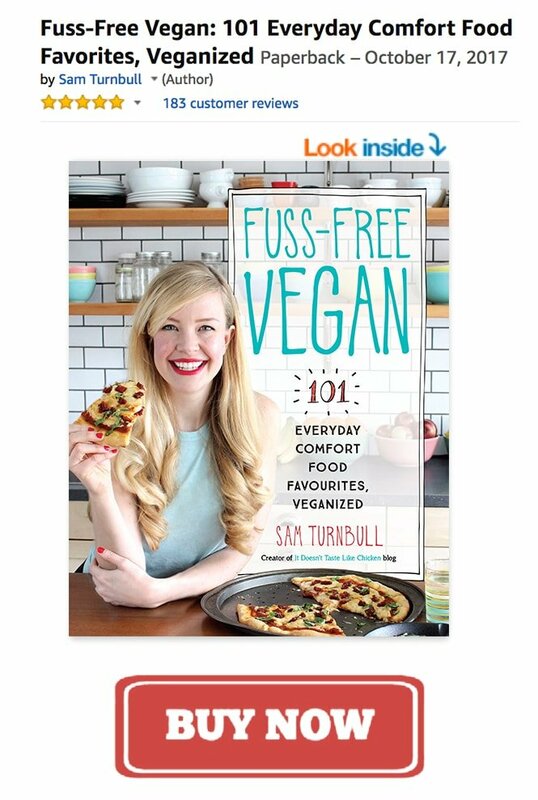 Now, having checked; I see that her recipes does indeed use tofu. Hi Lea, you could try using mashed white beans or chickpeas in place of the tofu. It will make the seitan a little denser but will still be delicious. Enjoy! Lea, I made a quick “tofu” from chickpea flour and water and used it instead of regular tofu. The recipe turned out great. Sam…was so excited all week to see this recipe and now I can’t wait to make them. Thank you for all that you do, you sure make eating vegan easy, fun and most of all, TASTY. I love that you do the hard work and we get to reap the rewards. Thank you again!